New research shows that the SVOD continues to expand its influence with consumers. It continues to expand its reach, frequency of use, and engagement. New data from CTA shows that the number of homes with SVOD services has increased to 53%. The penetration is up from 48% in 2016, and 39% in 2014. This data partially agrees with TiVo’s most recent Video Trends Report. TiVo found that 65.6% of consumers said they used at least one of the many SVOD services in Q1 2017. That is an increase of 4.9% year-over-year (YoY) and 12.8% over the previous three years. CTA also says that SVOD is more popular than pay TV in millennial homes. 74% have at least one SVOD service versus 42% of homes 35 years and older. The company also says SVOD is more popular than pay TV in those millennial homes. The CTA found that 56% of the consumers answering its survey streamed content at least five days of the week. 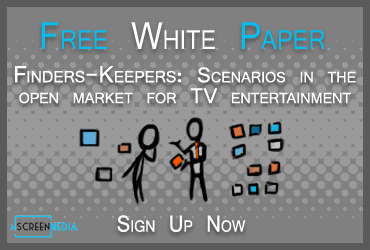 34% used SVOD services and 34% used free streaming sites. 19% used their pay TV provider’s streaming app and 11% a TV network’s website or app. However, almost all SVOD service users are now using their favorite services daily. TiVo says that 93.4% of SVOD users watch their service every day. That is an increase of 2.1% YoY. New survey data from Hub Entertainment Research confirms that SVOD users think they are using their services more. Hulu users say they were watching 64% more than one year ago. Netflix and Amazon Prime Video users claim to have increased viewing 56% more. Those saying they are using the services less are much smaller. Just 13% say they are watching Hulu less this year than last. 8% of Netflix users and 9% of Amazon Prime video users say the same. Millennial consumers once again seem to be leading the charge in viewing time with SVOD. When CTA asked them to apportion video viewing between live TV, DVR, and on-demand viewing (which includes SVOD), millennials said 35% of viewing was VOD, 45% live, and 20% via a DVR. Those 35 and older said two-thirds of viewing was live, 14% VOD, and 21% on a DVR. Netflix and Roku would probably agree their users are watching longer. Roku says users of its devices have increased per day streaming time from 2 hours and 24 minutes per day to 2 hours and 40 minutes over the last year. Netflix says its users are, on average, streaming for an hour and quarter per day. It also says that the busiest day ever occurred on January 8th, 2017, when the company streamed 250 million hours. That is two-and-a-half hours of video per subscriber. Should we believe Netflix and Roku? 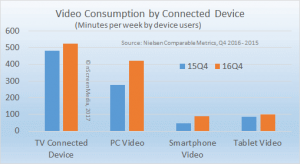 Data from Nielsen suggests we should. The company says in Q4 2016, the average streaming media player user watched their device about 1 hour and a quarter per day, up 9% YoY. Consumers do not seem to be tiring of SVOD services yet. SVOD reach, the frequency of use, and time spent watching all continue to increase. Millennials continue to lead the charge toward SVOD.